Nicolai-Messe. Composed by Franz Joseph Haydn (1732-1809). Edited by Volker Kalisch. This edition: urtext. 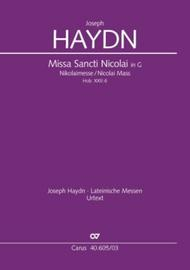 Stuttgart Urtext Edition: Joseph Haydn, Sacred vocal music. Haydn: Nikolaimesse In G Xxii:6. Innovative practice aids, Sacred vocal music, Masses, Latin. Vocal score. Composed 1772. Hob. XXII:6. 40 pages. Duration 27 minutes. Carus Verlag #CV 40.605/03. Published by Carus Verlag (CA.4060503). ISBN M-007-07296-4. Key: G major. Language: Latin. 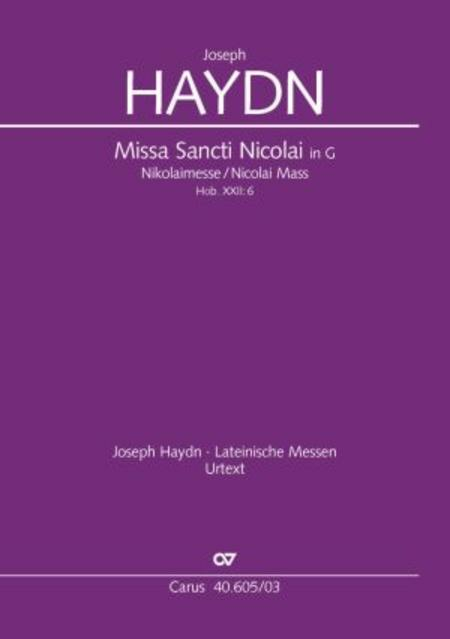 Haydn wrote the Missa Sancti Nicolai in 1772, probably for the name day of prince Nicolaus Esterhazy. This work is on a larger scale than the other missae breves, and in the orchestra two oboes and two horns join the strings. At the very beginning of the Kyrie the gentle, pastoral character which distinguishes this work is established. Haydn reprises the music of the Kyrie in the Dona nobis pacem to round off the work. The full score contains at the same time the organ part. This work is now available in carus music, the choir app! Score available separately - see item CA.4060500.